30 minutes in his company and you're left with the impression that this is a man you'd want on your ship in a storm. Which, given his role within the industry, is about as apt as apt can get. Ørbeck-Nilssen is the CEO of DNV GL Maritime. The Hamburg-headquartered operation is the world's leading shipping classification society, with a presence in more than 100 countries, classing over 11,500 vessels in the global fleet. The outgoing Chair of the International Association of Classification Societies (IACS), the Norwegian native (educated in Edinburgh, hence the appreciation of British humour) speaks with a quiet authority about the industry as a whole. “There are tectonic shifts within maritime on three fronts right now,” he opines over a coffee at DNV GL's group HQ in Høvik, Oslo. 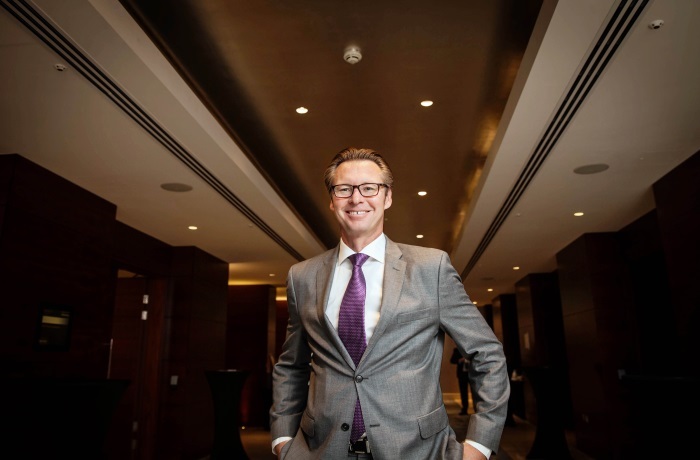 “We have the shifts in the market, which are increasingly unpredictable, shifts in regulations, headed by the upcoming 2020 sulphur cap, and shifts in technology, driven by the constantly evolving nature of digitalisation. “In the new digital reality data is our currency,” Ørbeck-Nilssen states. “Think of it as your cash. In the old days people would stuff it under their mattress. This keeps it safe, but also dormant, unutilized. However, when you invest it with others, when you share it on a platform – e.g. in a bank or investment fund – you can utilize that currency and create new value. Suddenly it's active; it's working for you. DNV GL services such as Smart Survey Booking or DATE (Direct Access to Technical Experts) can be accessed through Veracity, but so can services from independent third parties. Data can be shared in closed networks, or industry wide to help promote understanding, improve environmental standards or enhance safety. Shipowners can share data with manufacturers or suppliers to improve equipment performance, or with regulators to detail premium quality records, hence demonstrating lesser need for inspections. KPI results can be assessed, charterers can research ships, routes can be optimized across fleets… the possibilities are as open as the ocean's horizon. With increasing reliance on digital systems and interconnectivity, especially with regard to automation and autonomy, there's growing risk potential, particularly in terms of cyber security. DNV GL released its first ‘Cyber Secure' class notations in 2018 and is focused on demystifying the subject, providing practical advice on what is needed – on ships and shore – to combat threat and protect integrity. This ranges from classroom and e-learning modules for crew members, to penetration testing within organisations aimed at mapping awareness levels. Interestingly, this tailoring extends to letting ‘certified ethical hackers' loose on vessel systems to find potential loopholes, allowing owners (especially in the cruise segment apparently) to address them before someone else does. But it's not all about being digital. Ørbeck-Nilssen is a firm believer in people power – in talent, in experience and in doing business face to face. This is why he values DNV GL's presence in key shipping clusters, actively encourages collaboration, and is a firm supporter of Nor-Shipping. But then again, when you can stay calm navigating tectonic industry shifts, holding a big BBQ probably doesn't seem that stressful.